How many microbiologists does it take to change a tabloid story? I realise this is starting to look like some kind of dirty protest, but here is a window on to how the media sees itself in relation to scientific expertise, and how it copes with criticism, which just happens – entirely by coincidence – to involve the MRSA scandal. To recap: bloke with no microbiology qualifications in unaccredited garden shed “laboratory” finds MRSA on swabs given to him by undercover tabloid journalists for their “dirty hospital scandal” stories, but proper labs cannot find MRSA in the same places that this “leading MRSA expert Dr Chris Malyszewicz” (with his unaccredited American correspondence course PhD) has, and proper microbiologists have very good reasons for believing that the methods of this “expert” (who incidentally sells a range of anti-MRSA products) could not distinguish between harmless skin bacteria and MRSA. After the Evening Standard published an article starring Malyszewicz, “Killer bugs widespread in horrifying hospital study”, in which it claimed to have found MRSA in some very unlikely places in UCL hospital, two senior consultant microbiologists from UCL, Dr Geoff Ridgway and Dr Peter Wilson, wrote to the paper pointing out the problems with its methods. Not only did the Evening Standard not bother to reply, it ran another story, two months later, using the same flawed methods. That time Dr Vanya Gant, another UCL consultant microbiologist, wrote to the paper. And the Standard did deign to reply: “We stand by the accuracy and integrity of our articles. The research was carried out by a competent person using current testing media. Chris Malyszewicz … is a fully trained microbiologist with eighteen years’ experience … We believe the test media used … were sufficient to detect the presence of pathogenic type MRSA.” What you are being told here is that tabloid journalists know more about microbiology than microbiologists. Newspapers often like to believe that they have blown the lid on a huge scandal in which the entire medical establishment has joined hands to suppress the awful truth. This was the structure of the MMR story and the MRSA swab story, and many others. If it’s true, then the evil architects of medical lies haven’t sent me the circular. In fact, send me one example of a story where there was a unanimous medical conspiracy, and I will send you by return of email one video of me eating a copy of this article. Now I only mention this because on Monday, Radio 4 did a slot on Chris Malyszewicz, chasing up this story (hear it here). The really interesting bit comes at the end. The Evening Standard gives a statement saying: “We were not aware of any official advice that undermined our investigations.” My question to them, in the form of a thought experiment, straight from Karl Popper, is this: what piece of information could we imagine, even hypothetically, that would be sufficient to shake your belief in your MRSA results? Hm, maby an undrcover investigation into the “resuch labortry” where the tests were carred out, shown on prime time TV, and spun in such a way as to totaly discredit that labs results, and the humanitie graduate science corisponats of the tabloid press? Might do it, or maby it needs to be in a film, somthing like Super Size Me for science. I would have said a public apolagy by the MRSA “expert” owner of chemsol, but I doupt it would make much diferance. Or prhaps the moment they can make an exclusive hedline along the lines of: “Garden Shed science – results faked.”? For the past couple of years a number of scare stories about high levels of MRSA have appeared in many of our tabloid newspapers. And behind the papersâ€™ shock headlines is the man the popular press has dubbed â€œBritainâ€™s leading expert on MRSAâ€, Doctor Chris Malyszewicz, whose company Chemsol Consultancy in Northamptonshire boasts that itâ€™s among the leaders in helping fight MRSA, and which, via the tabloids, has helped to expose the shortcomings of a series of prominent hospitals. Quote: Our samples were examined at the Chemsol Lab in Northampton by Doctor Chris Malyszewicz. He said â€¦. JW: Well according to tests carried out by so called Doctor Malyszewicz heâ€™s found MRSA at hospitals up and down the country. But is Chris Malyszewicz really the expert that he and the tabloids would have us believe because many of the hospitals where he found evidence of MRSA subsequently carried out their own tests which gave negative results? Indeed the Malyszewicz testing methods became such a cause for concern that in July last year the Governmentâ€™s Inspector of Microbiology and the Health Protection Agency visited his back garden laboratory to see for themselves his procedures for sampling, transporting and testing for MRSA. And later this month Baroness Pitkeathley will be raising the concerns of health care professionals in Parliament. Well someone whoâ€™s been following the story week by week recently is the hospital doctor Ben Goldacre, who writes the Bad Science column in The Guardian. Doctor Ben Goldacre (Bad Science Columnist, The Guardian): Well I first got interested in it when a, about a year and a half ago friend of mine whoâ€™s an investigative journalist, an undercover journalist on another paper rang up and he said, â€œIâ€™ve been taking all of my swabs for my undercover MRSA swab scandal from a local hospital and theyâ€™re all coming back negative.â€ And he said, â€œWhat am I doing wrong?â€ And I sort of said â€œWell, you know, youâ€™re, what youâ€™re probably doing wrong is imagining that they should be positiveâ€, â€˜cause itâ€™s unlikely that youâ€™d grow MRSA from the kind of places that he was taking them from, sort of door handles and, and that sort of thing. And he said you know heâ€™d tried several different labs and, and he was worried that he wasnâ€™t following the protocol properly. And I said well you know probably best to leave it, which wasnâ€™t the answer that he wanted obviously. He came back to me about ten minutes later very triumphantly and he said, â€œOh Iâ€™ve, Iâ€™ve just rung up…â€ well I shanâ€™t mention her name, on a different tabloid, and he said, â€œSheâ€™s told me the lab to go toâ€, and he described that lab as “the lab that always gives you positive results”, which obviously sounded very dubious to me. Now as soon as I realised that, I started looking through the archives and I saw that it was true. In fact all of the positive MRSA swab scandals in every single newspaper all came from one company called Chemsol, based in Northants, with a chap called Doctor Malyszewicz. And thatâ€™s when I started looking in to the story. It turned out that Dr Malyszewicz wasnâ€™t actually a doctor. Heâ€™s got a non-accredited mail order correspondence course PhD from America and a, I think a, a, a, a polytechnic degree in chemistry from a very long time ago. JW: So heâ€™s not a microbiologist? BG: No, absolutely not. And I think when youâ€™ve got somebody whoâ€™s not a microbiologist whoâ€™s giving positive results where other people arenâ€™t and who is the place where all the tabloids are going, so all the tabloid, thereâ€™s not a single tabloid story that hasnâ€™t come out of this one lab, and I, and I, I would say that the (indistinct), the reason for that is that if they went anywhere else they wouldnâ€™t get the positive results that they want for their story. In fact people have gone round behind them in hospitals, on the very day I think that theyâ€™ve done their tests, if not the day after, where nothingâ€™s been changed in the hospital, and theyâ€™ve got negative results. JW: So what does this say about the reporting of MRSA by the popular press? BG: Well I think they, I mean they just wanted a, they wanted a, an MRSA swab scandal and they knew the man that was going to give it to them. I think it, I mean itâ€™s pretty wily really. And the, I think itâ€™s also a shame because MRSA is obviously a, a problem and I think it undermines, you know it undermines the, the, the reality of the problem with MRSA. And it also undermines the integrity of the press when theyâ€™re going round very clearly seeking out laboratories that will give them specific, you know the, the results that they want. JW: But, but MRSA, as you say, is a big problem, I mean it results in many needless deaths every year, I mean surely any highlighting of the issue is justified? BG: I just donâ€™t think itâ€™s right for journalists to go round making up stories like that. JW: Well theyâ€™re not making it up of course. Theyâ€™re, theyâ€™re being supplied these, these figures by Mr Malyszewicz. Youâ€™re just saying that you question the figures; you have questioned his results. BG: Well thatâ€™s very interesting. I mean when you talk to Mr Malyszewicz itâ€™s very obvious from the moment you get to him that this is not a man who knows his stuff. I mean, he talks in a very confused and confusing and slightly incoherent way. He uses technical terminology incorrectly. He mispronounces the names of very common bacteria. And also I understand from readings of reports of people whoâ€™ve been to his premises that really itâ€™s just a shed in the back garden. It doesnâ€™t have proper laboratory fittings. Itâ€™s got basically kitchen fittings. BG: Yeah absolutely. They want, they want the big scandal and theyâ€™re willing to, to do anything to put themselves in that quite grandiose position but I, but itâ€™s just not the reality with this story. JW: Well joining us now is the Governmentâ€™s Inspector of Microbiology, Professor Brian Duerden. Heâ€™s in our Cardiff studio. And Professor Duerden when you visited Mr Malyszewiczâ€™s laboratory back in July 2004 what did you make of it? What did you make of his, his testing procedures? JW: Itâ€™s a garden shed. Itâ€™s a garden shed. BD: Itâ€™s, itâ€™s better than my garden shed but it is a wooden building in his garden and itâ€™s not equipped to the level I would expect of a laboratory. It certainly would not pass any accreditation standards, whether this was with Clinical Pathology Accreditation or with the UK Accreditation Service. JW: And what about his methods for testing MRSA? Were they of a sufficient standard to give accurate results? BD: I was not at all convinced by his methods. In particular he was not doing methods that (indistinct) distinguished between common, harmless Staphylococci from the skin, Staphylococcus Epidermidis, which is very often Methicillin Resistant, but is, is not a harmful pathogen. Doesnâ€™t distinguish between that and Staphylococcus Aureus which then can be Methicillin Resistant and is the problem organism. JW: So you wanted to check? I mean he got these results that nobody seemed to be able to replicate, that there was MRSA present in various places. You wanted to check those. He sent you ten of his isolates, as theyâ€™re called, in which his tests showed his evidence for MRSA. What did you find when you looked at his findings? BD: Well when I visited nearly eighteen months ago with, with a colleague we asked him to send some of his isolates to the Centre for Infection, which is the Health Protection Agency Laboratory at Colindale, the national reference facility for Staphylococci, Staphylococcus Aureus. Now he didnâ€™t send them to my laboratory because that would be inappropriate; he sent them to the Health Protection Agency eventually a few months ago. And of the ten isolates that were sent in I believe two were identified as Methicillin Resistant Staphylococcus Aureus, MRSA, but they were of, of a very unusual type. JW: So where do you think they may have come from there? Where did they turn up? BD: I, Iâ€™ve, Iâ€™ve no idea. Heâ€™d, heâ€™d been sampling in an environmental setting somewhere in, in an NHS premises. JW: So letâ€™s be clear, of those ten samples that he sent you eight were just wrong and two were extremely dubious. Is that what youâ€™re saying? BD: Eight did not contain MRSA. Two did contain an MRSA but it was a very unusual strain. It was not one we would expect to find, or have found, in, in, in patients in this country. JW: So what (indistinct), what effect has Mr Malyszewiczâ€™s results, whatâ€™s that had on patients and staff at the hospitals where heâ€™s conducted these tests and, and which have appeared in the, in the headlines as a result? BD: Well there are two things. One, it frightens patients and it puts them off getting treatment in the NHS. The other is that it diverts the resources in those hospitals to answering unfounded criticisms. And this isnâ€™t to say that MRSAâ€™s not a problem; we do have hospital infections, health care associated infections, with this organism. But this, when you have wrong reports coming out, this just actually does nobody any good you know because science has to be based on fact, medical science has to be based on fact. JW: But as the Governmentâ€™s Inspector of Microbiology do you not have any powers to prevent someone like apparently Mr Malyszewicz who, about whom you have concerns, from, from carrying out such tests in his laboratory and publishing the results in the tabloids? BD: Well in fact not, not really because I, I have no right to go in and, and shut (indistinct) his laboratory down. Itâ€™s his private business. He is, heâ€™s not a member of a professional body; he himself is not a, a registered health care scientist or like myself a medical doctor who is, is a Fellow of the Royal College of Pathologists. So there isnâ€™t a professional body or a, a body like the Medical General Council; so thereâ€™s none of that. Neither his, his laboratory accredited so I, I canâ€™t go to an accrediting body to suggest that that be withdrawn. So there, there isnâ€™t a sanction there because heâ€™s not within the, the formal system. JW: And whatâ€™s been the response of the popular press when youâ€™ve raised your concerns about Mr Malyszewiczâ€™s testing procedures with them? BD: Iâ€™ve, well as you will have seen from the, the reports that have come out they, they have carried on and, and published this work and used his evidence. JW: Well listening to all of this is Chris Malyszewicz of Chemsol Consultancy. Heâ€™s in our Northampton studio. Mr Malyszewicz your results according to Professor Duerden there are, are not valid. What do you say? JW: But do you feel comfortable with the way youâ€™ve been referred to in, in the popular press you know as an MRSA expert? JW: But you, but, but I mean youâ€™re not a doctor are you? Youâ€™re not a microbiologist. Your, your lab is in a large, what amounts to garden shed. Itâ€™s not accredited and its results according to the Governmentâ€™s Inspector of Microbiology are dubious to say the least and wrong in most cases. JW: So youâ€™re, youâ€™re admitting youâ€™re not qualified to carry out these tests that the tabloids then trumpet as, as being valid? JW: You said you were not au fait with this area. Itâ€™s rather important that you are isnâ€™t it? CM: Well when I say au fait in other words itâ€™s not something that I have studied in depth until four years ago, that when we took this up as a long term project it was something that we actually embodied in to the actual contact slide principles. Now we have taken a lot of information from the right people, from Oxoid and those companies which are very experienced in detection of MRSA. The PB, or Penicillin Binding test is the ultimate gold standard for detecting Methicillin Resistant Staph Aureus on the (indistinct). Iâ€™m not saying for a minute I donâ€™t think theyâ€™re wrong. If they are wrong then obviously weâ€™re back to the drawing board. JW: But if your results are wrong, I mean youâ€™ve slurred the reputation of hospitals; youâ€™ve unnecessarily alarmed patients and of course youâ€™ve cost the tax payer a great deal of money as these tests are done all over again by the hospitals who then report they find nothing. CM: Iâ€™m, Iâ€™m very sorry to say that but in fact thereâ€™s a Scottish laboratory twelve months ago who did an independent result themselves and their results were horrendously higher than Iâ€™ve ever found before. So, no, I think thatâ€™s completely wrong to say that. JW: But Mr Malyszewicz I mean you, you sell donâ€™t you a range of anti bacterial products, so called MRSA kits. I mean you have a vested interest donâ€™t you in finding MRSA because you, you sell the, you sell the stuff to get rid of it? CM: Interesting question………… In fact… no, Iâ€™m not. As a formulator of a disinfection for industry and personal hygiene this, this is my living. I am unfortunate not to have vested interest in MRSA as this was never designed to enhance any sales of products. If I wanted to I could have offered products over three years ago when the situation was first discovered. It didnâ€™t happen that way. JW: How much money do you charge for one of your undercover investigations? JW: So itâ€™s quite lucrative since as I understand it some twenty articles have appeared where youâ€™ve undertaken extensive research? CM: I wish it was lucrative….. Our accounts donâ€™t show that unfortunately. JW: So are you not surprised when subsequently hospitals undertake their own tests and they find no traces of MRSA? How can they all be wrong, indeed the Governmentâ€™s own Inspector of Microbiology be wrong, and, and you be the only one right? CM: Well no Iâ€™m not. Why should they as itâ€™s not in their interest to show negative results and high level of infected materials. JW: Professor Duerden youâ€™re, youâ€™re, youâ€™re listening to this. Whatâ€™s your response to what you hear? Professor Brian Duerden: If youâ€™re to identify an organism Staphylococcus Aureus itâ€™s not enough just to grow it on an initial detection slide. You then have to go through a series of tests to identify it. The slides themselves are not sufficiently selective to just grow MRSA and I think that is where part of the problem is. JW: And what about the point made by Chris Malyszewicz that of course hospitals, itâ€™s in their interests not to find MRSA. No wonder they say they donâ€™t; they donâ€™t want to. BD: Well I, I would, I would challenge that (indistinct), very much. Weâ€™re talking here about people who are not only qualified but dedicated scientists who have a job to do. Itâ€™s not a case of â€˜in our interestsâ€™. If, if there is contamination there then it would be found. JW: So what, I mean what would you like to happen to Mr Malyszewicz and his research? Would you like it to stop or him go back to the drawing board or what? BD: I think if, if this sort of work is to continue it must be done to the sort of quality standards that we would expect of any laboratory serving the NHS. JW: I mean if I can just pick up again with you Chris Malyszewicz, what, what about the results of the tests that the Health Protection Agency carried out on the, on those isolates that you sent them, where youâ€™d found evidence of MRSA? I mean they found MRSA on only two out of those ten examples and the MRSA on those two was a very rare Australian strain, unlike anything thatâ€™s ever been found in the United Kingdom. Do you by any chance work for any Australian companies? Could there be cross contamination? Chris Malyszewicz: I donâ€™t work for an Australian company, no. Weâ€™ve only done one ever run for Sydney, which was prior to that anyway and those isolates were (indistinct) prior to any other work being sent to Colindale. JW: But if your results are wrong, as so many experts say they are, donâ€™t you accept you have caused the tax payer an awful lot of unnecessary expense and youâ€™ve caused a great many people a great deal of worry and concern? CM: No. I, thatâ€™s another thing I disagree. I have offered to do contact slide work in conjunction with any microbiologist and that was over a year and a half ago in any hospital that (indistinct) nominated that we know MRSA is a problem. And in fact I, I would guarantee that there would be positive results after a, a hundred slide survey. JW: Chris Malyszewicz of Chemsol Consultancy, Professor Brian Duerden, the Governmentâ€™s Inspector of Microbiology, and doctor and Guardian columnist, Ben Goldacre. Well we asked some of the tabloids whoâ€™ve used Mr Malyszewicz over the past couple of years to carry out their undercover investigations why they did and whether they would continue. The Sunday Mirror declined to comment but The Sun said, â€œWe stand by all our MRSA investigations done by Mr Malyszewicz. If our headlines have embarrassed the Department of Health in to taking action against MRSA then we are very pleasedâ€. And the London Evening Standard told us, â€œAlong with other newspapers and broadcasters we have in the past used this company to carry out tests as part of our reports. We were not aware of any official advice that undermined our investigationsâ€. Well Doctor Goldacre has vowed that heâ€™ll go on writing about this in his weekly newspaper column until the, the tabloids desist from using Mr Malyszewicz. From their response it looks like heâ€™ll be putting pen to paper for quite some time. Tabloid journalists may not know much about microbiology but they know how to write a good story, and “little guy in garden shed proves the establishment wrong” is a great story – just like you see in the movies. If you’ve got on ‘ology’ and a piece of paper that says Ph.D, that makes you two up on most tabloid journalists who probably couldn’t even tell you what MRSA stood for without looking it up. They could conduct an undercover investigation of the MRSA Shedbratory by disguising themselves as rats. Pondering how difficult this exercise would be is left as an exercise for the reader. I hope Dr Malyszewicz follows appropriate garden pathology procedures, such as disposing of his MRSA samples in a bonfire rather than on the compost heap. Operating an autoclave without proper training? He’s braver than we are. That or he has a very fireproof shed. Also, just because he disposed of the waste, it obviously doesn’t rule out cross contamination. It only takes one bacterium to grow into a colony on a plate after all. Surely one newspaper will crack soon and run a huge piece on how the “leading MRSA expert” is actually a bit (or a huge) laughing stock. I won’t hold my breath, it would force them to acknowledge they were wrong in the first place and the newspapers (especially the tabloids) hate to admit that! Bit off the point but I have just finished reading a paper for my third-year project with some very bad science in it, the manipulation of statistics to produce significant results. “I was at ITN at the time being interviewed. It came a shock to me. Wow, that thread is full of real stupid, JonnyW. came to inspect my privately owned laboratory and to check my new methods of MRSA determination. I’m guessing that would be surprise at how little expense and effort he had gone to? That whole forum is excruciating to read: the whole anti-MRSA scene appears to be a minefield of dubious credentials. Check out the Products Forum too: latest silliness is someone professing to represent a group called Academia, which will “decided to monitor the press and internet for misinformation regarding products marketed to the healthcare sector. The reason for this is because we need to uphold standards of ethics and efficacy and correct, or expose, individuals and companies that publish information that is misleading or untrue“. Except they won’t tell you who they are, so any statement isn’t worth a damn. They do include two “microbioligists” though. Perhaps somebody working at Chemsol Shedquarters has this rare Australian MRSA living in their nostrils? My favourite bit of press reporting about MRSA is a discussion about finding “the methicillin sensitive strain of MRSA”. So that’s just plain staph then? How worrying. I don’t want to defend what sounds like poor confirmatory procedures and obviously using fake titles is bad. However I’d like to add that a having a PhD and an accedited lab are not essentials for detecting MRSA – it’s about the level of an undergraduate experiment. Malyszewicz’s results can’t be relied upon, but neither can we confidently expect that hospitals are taking this in hand. They do not allow people to come in and sample the environment, and do not routinely (if ever) do so themselves. Guidelines say wards are to be visually clean, nothing more. If hospitals did so, and were open about the results, media scare stories (and people making money off the back of them) wouldn’t be a problem. The dirty hospitals and MRSA link is just Bad Science. Hospitals actually do spend a great deal of time and resource isolating and typing Staph. aureus from patient samples. They don’t spend much time looking for it (methicillin sensitive or resistant) on hard surfaces as it just doesn’t survive there. S. aureus, although it may be antibiotic resistant, is very susceptible to cleaning materials and the stress of not being above 30 deg C. It’s a skin/nose/mucous membrane micro-organism. I’m not saying it isn’t a problem in our hospitals – of course it is: our hospitals are full of people – but it’s not associated with dust on the floor. Now if you want to look for trouble – a pathogen with the ability to survive on hard surfaces and a risk to the immunocompromised – look for a Gram negative environmental microorganism like Acinetobacter sp. *The Baroness Pitkeathleyâ€”To ask Her Majestyâ€™s Government what is their response to reports that tests for methicillin resistant staphylococcus aureus (MRSA) may be falsely positive as a result of using a single laboratory. Lord Warner (DoH) is due to reply. What about a little experiment? If I read this right, then Mr. Malyszewicz (copied that) should get false positives nearly all the time. Why not do a swab test with samples from all the tabloids offices? (Of course blinded) The expenses would be worth it, I think. A swab test from Chris Malyszewicz’s nose/skin tested in an accredited lab might be more amusing. Edie, do you have any evidence that MRSA and hospital surfaces is Bad Science? Because from where I am typing, you are using the bad practice of one person to smear an entire branch of investigation. The work on dust and floors is decades old, and specific to dust and floors. Your claims about MRSA on surface don’t bear much scrunity either. bathroom doorhandle, infusion pump handle, room doorhandle, nurse gowns, nurse gloves, Furniture, Floor, Medical equip, Bed and frame, Flat surfaces, Door handle, Ventilation grill, Radiator Nurse call button, strecher, wheelchair, shower chair, bathtub, footwash, bowl, shower handle, shower curtain, Examination tables, Nurse keyboard, Telephone reciever, Tap, Working table and many other. All in published literature, none with Dr M. Not exhaustive either, I got bored copy and pasting. So please don’t tell me that MRSA isn’t on surfaces and that it can’t survive there. The link to infections isn’t proven and maybe there isn’t one. But it isn’t Bad Science to try and find out., if you do it properly. Dismissing it without investigating it is. so-called laboratory does not meet UK accreditation standards. unsound methods, are given wide publicity in the media. investigations should be accredited or registered for accreditation. NHS than reporting the facts? some parts of the media. I think that they shouldn’t have just focused on how the lab was not accredited. This will just back fire in the tabloid press as another sign of ‘cover-up’. They should have drummed the issue home by explicitly referencing the fact that the lab results have never been significantly replicated by independent investigators. Baroness Pitkeathley My Lords, I beg leave to ask the Question standing in my name on the Order Paper. In doing so, I declare an interest as a survivor of MRSA. The Question was as follows: To ask Her Majesty’s Government what is their response to reports that tests for methicillin resistant staphylococcus aureus (MRSA) may be falsely positive as a result of using a single laboratory. The Minister of State, Department of Health (Lord Warner): My Lords, I am sure that the whole House congratulates my noble friend on that. approved standards and operating procedures. The results should be validated by process controls, internal quality control and participation in an external quality assurance program. It is disappointing that test results for MRSA produced by unsound methods are given wide publicity in the media. This causes unnecessary public concern and wastes NHS resources in countering them. Baroness Pitkeathley: My Lords, I thank my noble friend that helpful reply. Does he agree that the continued use of one particular laboratory which has questionable qualifications and results by the tabloid press shows more interest in criticising the NHS than in reporting the facts? Is he further concerned that this particular laboratory appears to derive most of its income from selling disinfectants to combat MRSA and thus might perhaps be seen to have a vested interest in achieving positive results? Lord Warner: My Lords, I entirely agree with my noble friend’s concerns about the laboratory in question and the uncritical acceptance of its results by parts of the media. The main source of the misleading information in the media is Chemsol, which is run by a person who is not qualified in microbiology, is not a member of a recognised professional body and whose so-called laboratory does not meet UK accreditation standards. The methods used in this laboratory do not distinguish between harmless bacteria found on the skin and the potentially harmful MRSA. Baroness O’Cathain: My Lords, if the laboratory does not reach accreditation standards, why do the Government not close it down? Lord Warner: Wait for it, my Lords; there is quite a good answer. Dr Malyszewicz, the owner and operator of this so-called laboratoryâ€”and I am using the term advisedlyâ€”is not a member of a recognised professional body as a microbiologist. Nor is he a registered healthcare scientist or medical doctor. His laboratory is not accredited as a diagnostic laboratory. In those circumstances, he is not actually claiming to be any of the things for which we could take professional action against him. Lord Rooker: My Lords, it is the Liberal Democrats’ turn. that we obviously share around the House about people passing themselves off as experts in microbiology when they are not? Lord Warner: My Lords, I would certainly commend to the House the work done by the BBC in its program “You and Yours” on Radio 4 on 14 November, which exposed the circumstances involved. We sent down our inspector of microbiology as long ago as July 2004 to inspect these facilities, which were described as a “garden shed” on the Radio 4 programme I mentioned. We have written to the media to explain the circumstances and given them copies of the inspector of microbiology’s report. We expect some parts of the media to behave with a little more responsibility when we have given them this information. Lord Soley: My Lords, is that not the core of the problem? The MRSA scandal is not the first example of a media scare, with people being genuinely worried and scared by a story that had virtually no substance to it. There have been many other examples of science being misreported in this way. It is not for this House or even the Minister but perhaps for the scientific bodies and, inadequate as it is, the Press Complaints Commission to start looking at how hopes are raised unrealistically and fears are raised unreasonably by press stories that show no scientific understanding. That also undermines public confidence in scientific thought and method. Lord Warner: My Lords, I agree entirely with my noble friend’s remarks. We all accept that there are some serious issues around MRSA in this country, as there are throughout the whole of Europe, that have to be tackled; but they have to be tackled responsibly and not irresponsibly as has been the case in this area. Lord Rooker: My Lords, it is the turn of the Cross Benches. Baroness Masham of Ilton: My Lords, would it not be a good idea to make MRSA a notifiable condition so that a qualified person would sign the form? Lord Warner: My Lords, consideration has been given to that although it is not the situation at the moment. However, I would say to the House and the noble Baroness that we are the first government to introduce a mandatory surveillance reporting scheme on all healthcare-associated infections. We publish the results on MRSA as part of that. The scheme is being conducted by the Health Protection Agency. Lordships today is not the only one involved in this report. The Minister talked about “validation”. I assume that he meant validation not of laboratories but of tests. In the days of the Public Health Laboratory Service, difficult tests were almost invariably checked in other labs within the service. What is the position now? Lord Warner: My Lords, there is an arrangement for accreditation, and I can send noble Lords the full particulars. As I said in my Answer, they are based on quality assurance, quality controls and participation in an external quality assurance scheme. So people are not just self-regulating. They are applying in a similar way to that which the noble Lord mentioned. Baroness Tonge: My Lords, has the Minister read Florence Nightingale’s Notes on Nursing, which was written in 1860 before bacteria were even discovered? It contains an excellent blueprint for hospital hygiene and good nursing care. I wonder whether he would undertake to send it to all hospital managers for Christmas this year. Lord Warner: My Lords, I certainly would not want healthcare managers to be diverted from their current tasks in managing the NHS and achieving financial balance. However, I shall undertake to read the book if the noble Baroness will undertake to make a full study of all the measures that the Government have taken to improve hand hygiene and tackle MRSA. i am unbelievably gutted that i didnt get a mention by their noble lords. On You and Yours today, Friday 2nd December, Liz Barclay claimed that the MRSA lab scandal had been exposed by that program on 14th November. 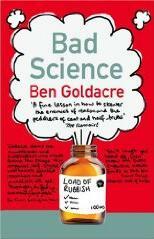 I thought Ben Goldacre had originally exposed the fiasco on Saturday 15th October 2005 and on several other occasions.